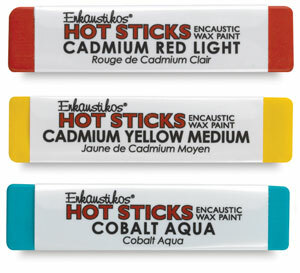 Hot Sticks are ready-to-use professional encaustic paints. Artist-quality colors made from the most beautiful pigments, the finest damar resin, and United States Pharmaceutical Grade (USP) beeswax, Hot Sticks paints contain no bleach or synthetic adulterants. Plus, because they're solvent-free, they require no turpentine or mineral spirits for cleanup. The new square paint stick shape allows artists to use encaustic paints in a whole new way. The Hot Stick design is very versatile. You can use Hot Sticks for encaustic painting, printmaking, rubbings, and even mixed media techniques. Hot Sticks can be melted directly on your hot palette to create a puddle of color for your brush or can be applied directly on a heated substrate. When applied to a heated substrate, Hot Sticks glide just like lipstick on your piece creating those vibrant colors or subtle earth tones you love. 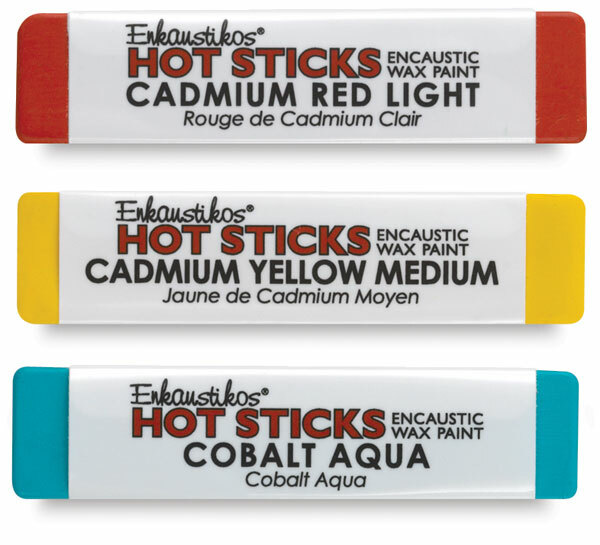 Enkaustikos uses only the finest, artist-grade, lightfast pigments in the manufacture of Hot Sticks encaustic paints, which are engineered to withstand the heat requirements of the encaustic process without color shift. The company's milling operation employs state-of-the-art technology capable of shearing pigments to their smallest particle size to bring out their true personalities. Painting with Hot Sticks encaustic paints allows delicate layering of thin, transparent glazes and the creation of heavy impasto textures within minutes without concern for "fat over lean." Scraping to reveal underlying colors or add texture, surface modeling, and other techniques are accomplished easily with Hot Sticks. They're ideal for altered art, painting, printmaking, book-making, mixed media, sculpture, photography, and even digital art. Unlike other art mediums, encaustic paints can be reworked immediately or even years later simply with the addition of heat.